No, this is not real. This is what I want to tell them when we meet again. A simple “hi”. I haven’t seen my parents since the summer of 2015. That was the last time I met them face to face. Since then a lot has happened. And more will follow. The first time I left, my mother and my father asked me to be careful. To be a good person, to take care of myself and try to be the best. I will never forget these words. They said to me something similar that day. The last time I saw them, in 2015. I remember, when I was still a kid, I used to love going to lake Van. I kicked the strong waves, to strengthen my legs. May 2017, the day Enes Kanter arrived safely in the US after his passport was cancelled from the turkish government. Man, I will never forget seeing and reading all the research of my dad at his lab. I was a shy kid. But I was also a rebel. I still am. I witnessed a lot. Since the day I left Turkey to come to the United States of America. I saw things from a different perspective. I saw the crazy transformation of my country. It was in 2002 when Recep Tayyip Erdogan’s government was elected. They started well. By saying and doing good stuff. Recep Tayyip Erdogan is to blame. He is more responsible for what has been done than the people of Turkey. At first he meant well. Later on he deceived people, by saying that he would do nice things, but he did the opposite. Partially it is the people’s fault because they should been holding him and his administration more accountable when it was needed; For example, during December 2013 graft probe operations ,everybody knew it was Erdogan and his people involved in the corruptions but nobody showed reaction and contrary they voted for him 4 months later during the municipal elections. They ask me if Erdogan’s an evil man. He isn’t. I can’t say he’s evil because I would respect to his individuality, I can only assure you that he is not the most ideal political leader ever. He treats people of Turkey unfair, he bullies them. He deprives them of their freedom. Somebody must say something about this. And this is what I do. I want to be the voice of those who cannot speak. I am not a freedom fighter. I play basketball and through the power that the NBA gives me, I try to help those in need. I love my country. My problem is the government and president Erdogan. A lot of people approach me and tell me to make softer comments. But I don’t regret it a second because this is who I am. I am not a person who would go silent because of what others say. My team, the New York Knicks, is in London for a regular season game for the NBA. I can’t be with them. I fear. I’m afraid for my life. I’ ve never felt like this before because there wasn’t Erdogan and his tyranny regime in my life. 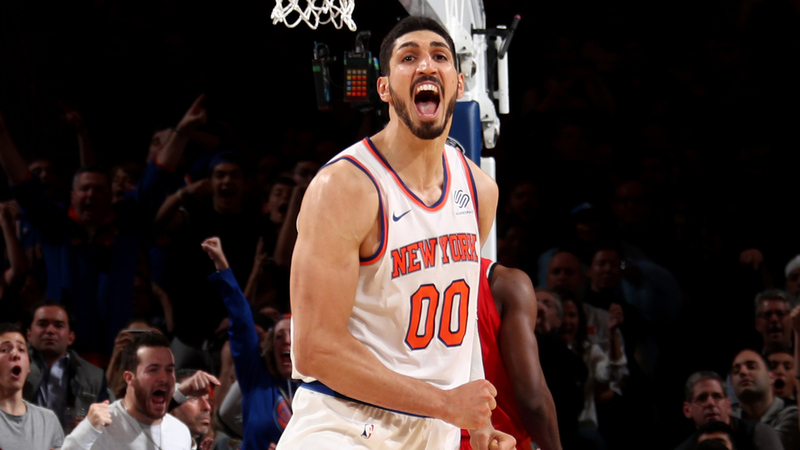 Enes Kanter with the Knicks jersey. It’s painful. I can’t travel. I can’t leave the United States. It hurts. Not because I will not see Turkey or any other country again. But because they have taken from me the freedom of travelling. I know for sure that millions of people in Turkey would like to stand up and speak, but they won’t because they are terrified. This is what I want to change. You know, I have thought about it many times. What I would do if I became the president of Turkey. I would amend the current constitution with the help of a diverse background legislature to make sure everyone has a voice in the making. I would make sure that the constitution would only defend the freedom and people’s human, political and religious rights. This is my goal. One day when I will be able to return to my country, I want it to be a united, free, democratic, energetic, welcoming Turkey. 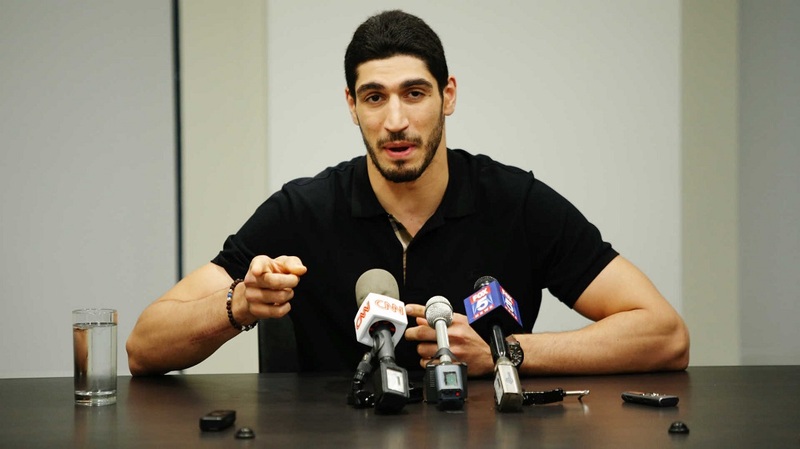 Enes Kanter is a professional basketball player currently playing for the New York Knicks.